On Nov 14 in the NBA the Jimmy Butler saga ended when the Minnesota Timberwolves trader Butler to the Philadelphia 76ers for Robert Covington and Dario Saric. If you aren’t a basketball fan, Butler was demanding a trade and it turned into an ugly ordeal. The interesting thing has been how much better the Timberwolves have been since the trade. A big reason for the uptick is the addition of Robert Covington. Covington is a skilled player but nobody would argue he’s more skilled than Jimmy Butler. What he brings to the table is an intangible that’s hard to measure. He is a guy on the court that plays hard on every play. Cheers on his teammates. Dives for loose balls and his energy is contagious – he raises the collective energy of the team. 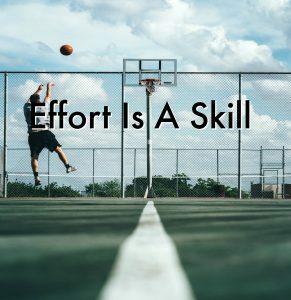 Here is my takeaway – Effort is a skill. And just like on an NBA team – there are energy drivers in many organizations. The person who works hard everyday raises the energy level of everyone. The person who cheers on the team and brings a contagious spirit that is positive and elevates the overall attitude. The person who doesn’t stop until the job is done. Effort is a skill and maybe that’s what you can bring to the table to impact your team.